SOLD BY :Soulager Healthcare Pvt. Ltd. Saw Palmetto supplements are a popular choice for men looking to help improve the health of their prostate. Saw Palmetto is believed to be especially effective when combating symptoms of an enlarged or inflamed prostate. Saw Palmetto supplements contain nutrients that can help to shrink the inner lining of the prostate which may then relieve pressure on tubes that carry urine. This may help to prevent prostate and urinary infections from developing. Saw Palmetto is a type of berry that contains very high levels of essential fatty acids, plant sterols and flavonoids. 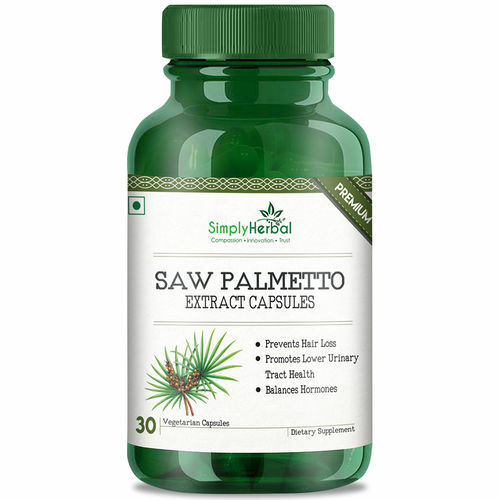 The high quality and quantity of the Saw Palmetto standardised extract used in Simply Supplement's 3000mg tablets are perfect for male customers who are either dealing with prostate health issues or wish to avoid them as much as possible by using premium grade, high-quality supplements packed full of highly concentrated levels of Saw Palmetto. The super strength tablets offer ideal daily support to help boost prostate health. Women may also benefit from taking Saw Palmetto supplements due to the reported benefit towards heart health and circulation. High levels of essential fatty acids in Saw Palmetto seeds are believed to help normalise blood pressure and cholesterol levels. Simply Herbal (Soulager Healthcare Pvt LTD) believes that natural remedies work best and has come up with effective weight loss, fitness and nutrition products that are both effective and natural. These herbal products contain the most natural and effective formulation of trusted natural ingredients that are carefully processed and manufactured in a GMP certified manufacturing facility so you can be sure that you're safe. The products are all natural and vegetarian with no non-vegetarian ingredients used and contain no artificial ingredients.